With more than 40 years experience, we are experts in rolling out emergency responses in complex settings. Within a matter of minutes natural disasters such as earthquakes, tsunamis and hurricanes can overwhelm an entire population. Thousands of people can be injured or traumatised by the loss of family, friends and homes. Clean water, healthcare and transport are also often casualties in these disasters. Rapid medical care and coordinated emergency response are vital to protect survivors. From large-scale catastrophes to local emergencies, MSF’s network of aid workers and supplies around the world mean we can quickly respond to disasters. Indeed, we treated our first patient after the Haiti earthquake within three minutes. We put highly skilled medical staff, logisticians and water and sanitation experts into disaster zones. 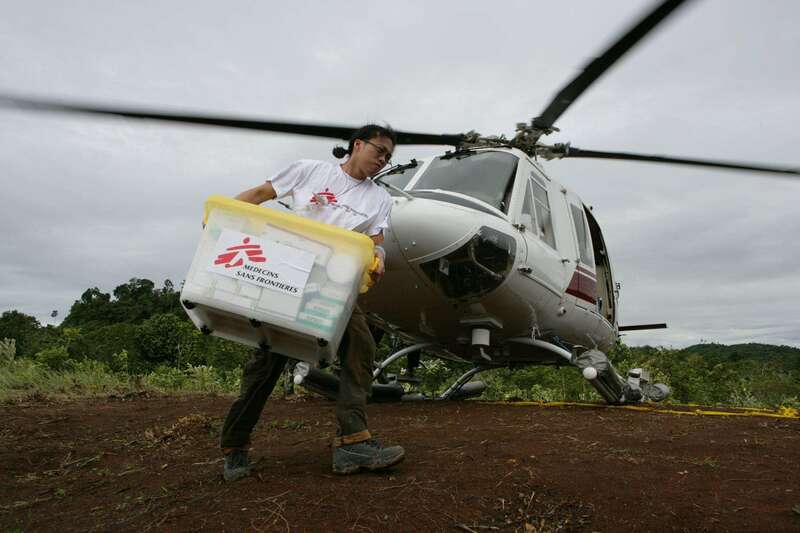 Over decades we have built up a system of logistical support and a large pool of experienced MSF staff that can be mobilised in a short space of time. Nearly 90 percent of our funds are raised from the generosity of private donors, which gives MSF an unrivalled level of independence. Because of this, we can respond immediately without having to lobby governments or institutional donors for aid. We only appeal for extra funds if the disaster is very big and we really need extra support from the public. The 2010 earthquake in Haiti was our largest emergency response to date. The disaster killed 220,000 people, left 1.5 million homeless and destroyed 60 percent of health facilities, including two of our own hospitals. We responded by recruiting thousands of new staff, mostly Haitians, who worked in 26 medical centres – including an inflatable hospital on a football field. In 10 months we treated 350,000 patients, performed 16,000 surgeries, and when cholera broke out we treated 60 percent of cases countrywide. For MSF, this is the humanitarian act: to seek to relieve suffering, to seek to restore autonomy, to witness to the truth of injustice, and to insist on political responsibility..."
Haiti showed how responding to a natural disaster often goes beyond the immediate crisis. The emergency phase, where we responded with surgery, medical care, psychological support, food, shelter and water, was relatively short. In the long term, we needed to contain and limit the spread of infectious diseases, re-establish healthcare systems and support people who had lost their homes and were living in temporary shelters. Because we already run projects in over 60 countries around the world, we often have aid workers already nearby when a natural disaster strikes. They are supported by ‘Emergency Teams’ on permanent standby in headquarters, who are experts at doing quick assessments and organising immediate response. Medical and logistical supplies, in the form of pre-packaged kits ready for rapid deployment, are stored in warehouses in key locations worldwide, and a roster of experienced staff willing to drop everything and leave immediately to work in a disaster means we can be there where people need us as quickly as possible. Urgent medical cases cannot wait. As an organisation, we pride ourselves on the incredible support of our donors. Our funding structure relies on lots of regular donations from hundreds of thousands of individuals around the world who give us money every month. This gives us the flexibility – and the ready cash – to respond to emergencies as they happen rather than setting up individual funding ‘pots’ for each separate crisis. It is rare for us to solicit funds from the public for a single crisis – we take the decision to do so collectively and very carefully because we have offices in over 20 countries around the world and we want to make sure that we responsibly only raise what we will need to spend. In 2004, following the Indian Ocean Tsunami, MSF found itself very quickly over-funded for the work we needed to do (people had either died or didn’t have extensive medical needs and the global public response was massively generous). This was despite closing our appeal after just a few days. We are now very cautious about matching ‘earmarked’ funding with operational budgets. We judge very carefully how much we’ll need for our work and how much the public might give us. In an emergency this is hard to do and sometimes we get it wrong, for example, with the 2010 Haiti earthquake, when we ended up needing, and spending, a lot more than we allowed ourselves to raise. But our donors can be confident that we think very hard about asking for any extra support – if we do ask for additional funds for a crisis, it’s because the scale of the needs and our response, really warrant it.